DPP-250S II plate style ALU-PVC/ALU-ALU blister packaging machine combines the structure specialties of the plastic machine and packaging machine. It is the innovative new machine which can reach the demand of GMP for the leechdom producing. 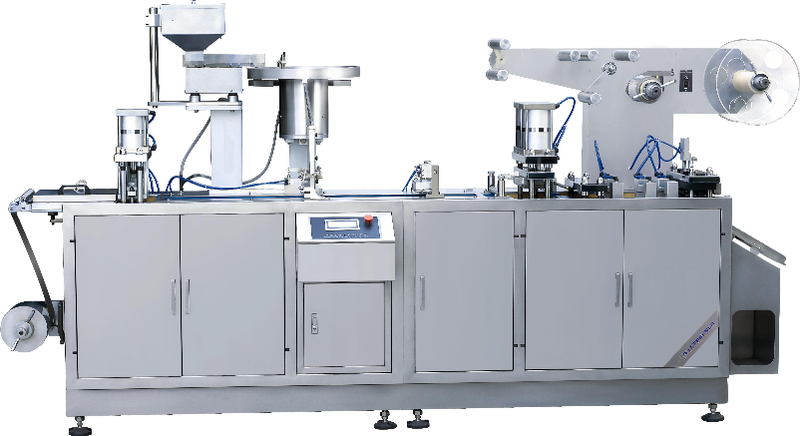 This machine is fit for ALU-PVC and ALU-ALU compound sealed packaging with capsules, troches and other unfamiliar shape products from the trade of pharmacy, grocery, electronics and medical treatments. The motor adopts turn-arm planet frictional regulation, having longevity and little noise. Control system is steady and safe, with good security. The distance of forming, hot-sealing, perforation and cutting components can be adjusted arbitrarily according to variety of blister sizes. Blistertowing manipulator using air chamber drive can be operated conveniently and the piston stroke is arbitrarily adjustable. It has tank-type mould, easy to change. Heating plate temperature control detection, overload protection for main motor, forming aluminum or PVC and PTP packaging material level detection. Adopt PLC control, encoder data collection devices, touch-screen operation, words and numeric display, words indication of failure diagnosis, which is easy and reliable to operate and convenient to maintain. Adopt detachable design, main transmission adopts synchronizing belt with flexible coupling, easy to carry and install.